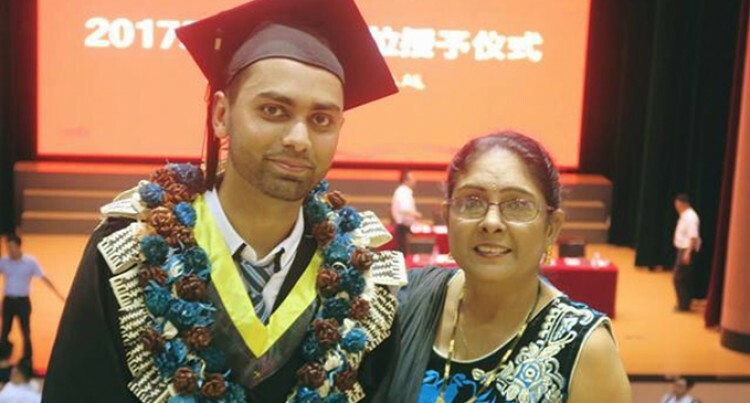 Varun Kapoor with his mother, Shammi Lata, during his graduation in China on June 22, 2017. Photo Supplied. A fresh graduate from the Wuhan University of Technology in China said Fiji would reap dividends in the future by investing in youths to learn the art of civil engineering in China. 30-year-old Varun Kapoor who walked away with a Bachelor of Civil Engineering (Roads and Bridges) in June said there was a huge potential in improving roads and bridges in the country. “Everything around Fiji motivates me,” Mr Kapoor said. He said instead of hiring China Railways to work in Fiji, developing students with information, knowledge and skills would harness the depth needed to develop the infrastructure. He said even though the learning was very difficult, a lot of sacrifice was needed to graduate. He said the first day he arrived in China he didn’t know the language, the food was foreign and everything was taught in Chinese. He said the Chinese were very strict with their teaching and overseas students had an eight-month orientation limit to study with Chinese students. He said he learnt the Chinese language in 2012 and did his undergraduate studies for four years. He said the Government was relying on the China Railway and Fulton Hogan for the developments of roads and bridges. He said sending more youth to study in China would provide the same manpower and skills back to Fiji. He said China was very advanced in terms of development and technology in the world right now. “They have big buildings, bridges, and highways and I always have the passion to apply my knowledge when I come back to Fiji,” he said. He said in terms of education people who wanted to study in China needed to sacrifice their time. Mr Kapoor was born and raised in Kinoya in Suva, and is the youngest of the four siblings. He graduated from the Fiji National University with his Advanced Diploma in Civil Engineering in 2009 before furthering his studies in China. He was awarded two scholarships; the Chinese Scholarship Council and Tertiary Education Loans Scheme (TSLB) to complete his studies.